Perform testing with ease, as AppCode integrates with XCTest, Quick, Kiwi, Catch, Boost.Test, and Google Test frameworks. Get the best of test-driven development with an easy-to-use and fluent unit test runner. It will show you the progress of overall tests execution with a tree view for all running tests including information about particular test status and duration. You can then sort tests by duration, rerun any test, all test or all failed tests. Test history is automatically saved and you can easily view previous testing results or export it for future use. In AppCode you can have several test run configurations that you can execute from a special popup. 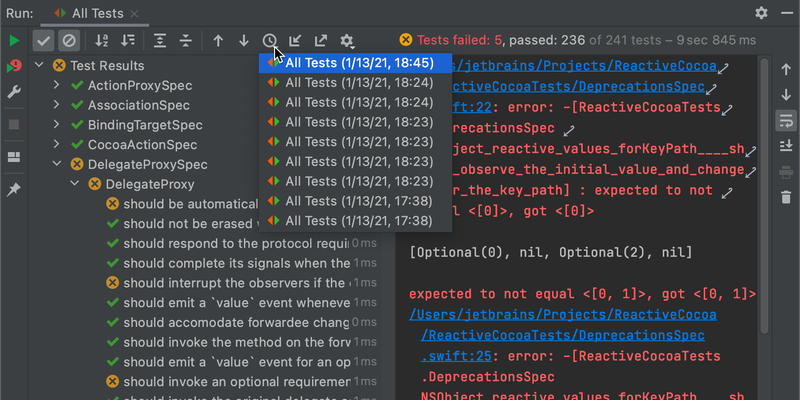 Alternatively, you can run a test right from the editor: depending on the context you are in, AppCode will run a single test, or all tests in a scope - just press ⌃⇧R. Use the Code Generation action (⌘N) to get unit tests’ methods, setUp/tearDown methods for XCTest or Google Test, and standard blocks for Kiwi (it, context, beforeEach,afterEach and specify). Right in the editor you can easily jump between tests and classes using a simple shortcut (⌘⇧T).